A little bit o' business now. As of this morning, this was not up on Clipper City's website as of this morning, so I'll put it here. Today the brewery is shipping out the first cases and kegs of its new Heavy Seas spring seasonal: Holy Sheet Uber Abbey Ale. Sailing out of the centuries-old brewing tradition of Belgium’s Abbey monks, arrives our Heavy Seas Spring seasonal – Holy Sheet Über Abbey Ale. 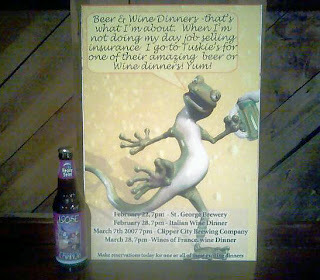 Aromatic, full-bodied, and pouring a deep burgundy color, it’s an Abbey-style double, but at 9% abv, it's even more robust. For you landlubbers, a sheet is a rope that controls a ship's sails. So, we say, “Grab a line – Holy Sheet – or you’ll be swept overboard!” Limited availability - March through May. To that 'official' description, I might add it shows the character of low-toned fruit, fresh nutmeg, 'grandma's attic', dark rum, and an alcoholic snap at the end. This Wednesday, Clipper City's owner, Hugh Sisson, and I are the guests of Shawn Malone at Tuscarora Mill in Leesburg, VA for a dinner featuring 6 of our beers, each paired with a different course prepared by Chef Patrick Dinh. 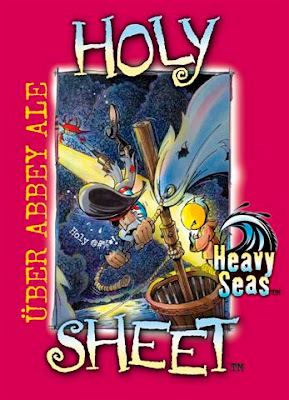 And ... that evening will be the first time cask Holy Sheet Uber Abbey Ale will be available anywhere. Please join us! Post gustibus: Chef Patrick was quite gracious. He substituted vegetarian plates for me.